THE MUSIC BUSINESS, MUSIC EDUCATION, AND THE MIDDLEMAN: Copyrights, Your Rights, Their Rights & Tresona. – Block Us Up! To write or not to write… And what is right? Hopefully this article will help with this copyright conundrum. I usually attempt to make my articles enjoyable for both band fans and directors, but this one is mainly for the latter. The average reader may not be aware, or even care about any of this, but there is a major “adjustment” under way concerning how marching bands, legally, perform copyright protected music (basically all popular music). So how much will it cost a band director/hired arranger to get permission to arrange one song? Well, the average license fee for a song can range from $250 to $400. If your show consists of a fanfare, drill, dance feature and a concert selection/ballad, you’re already well over a thousand dollars for one show (don’t even think about dance routine music)! You haven’t even added the 20 or so songs you save for the stands! For the average college band, this can get VERY expensive. I guess bands will have to use all the money that’s pouring in from their performances (you can stop laughing now) to pay these companies who own the rights to the music they paid someone to arrange for their bands. I don’t recall the last time a school has paid a marching band to perform at any football games across this nation but maybe it happens somewhere… Many bands have elected to not perform any “modern” or “popular” music for this reason. Could you imagine going to a football game and the band can’t play ANYTHING that is “popular” or currently on the radio? Well, soon you may not have to imagine it because that day is coming… Actually, it may already be here because if your favorite band currently plays songs from Prince, Guns N’ Roses, or Bruce Springsteen, then they are breaking the copyright laws. These artists, and a few others, will not grant custom arrangement licenses to anyone, under any circumstances. I’m not sure why the tone of the letters are so different… Maybe Tresona has softened their approach on this issue after losing a lawsuit against a show choir in California (Yes, they actually sued a show choir). Or maybe they now understand that band directors, and music programs in general, are not sitting on a pile of cash. Either way, rules are rules and the law is the law so we will attempt to help you better understand it all. #1 – You DO NOT NEED a license or special permission to perform sheet music you bought for concert or marching band if you perform that music with no “noticeable” changes (transposing parts is allowed). What does that mean? Well, performance permission is included in your original purchase price. 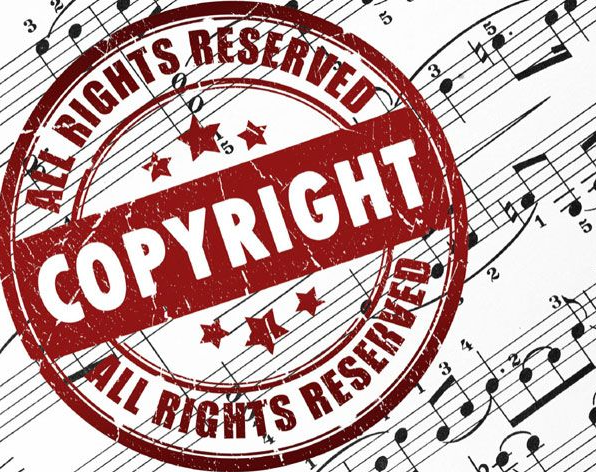 #2 – If you change a copyrighted song, or create your own custom arrangement of it, you are then required to get permission from the copyright owner, in the form of a “license”. #3 – If you perform copyrighted music in public for profit, you need a license for that as well. Most bands, above the high school level, pride themselves on being unique and different and will NEVER perform a stock marching band arrangement (well most of them, Lol). They have arrangers and composers on staff that create all the music their ensembles play. In these instances it would be wise to join a licensing organization. There are many. You don’t have to be bullied into someone’s organization by way of an “amnesty program” (Lol, I can’t believe they typed that). Just do a little research yourself and you should be covered from all the legal conundrums and copyright trolls out for a quick buck. Remember, Tresona does not own the rights to any of the music they will sue you for. They are merely the guys that represent the guys that own the rights to the music. They are the middleman between the music educators and the music execs. In most cases, the best course of action is to always avoid the middleman. If you know what music you want to play, simply contact the rights owners directly and request the license. If you inform them exactly what the arrangement is for (co-curricular and extracurricular educational venues), most of the time they have a educational program for schools that is different than a business like Disney licensing some music from them. This approach will save you lots of headache and money. Independent band arrangers, those with no budget behind them and who do this basically for free, a site that was recently brought to my attention is Sheet Music Plus. They have a catalog of over 1,000 songs, that they own the rights to and they allow their members to arrange those songs for FREE and it’s FREE to become a member… and you can SELL the arrangements on their platform. There are many more like this out there, you just have to do your research. Remember if you find a selection you would like to play, the best thing to do is just to contact the rights owners directly. For DCI and college arrangers and more established HS programs who perform songs all year, one of the best is BMI. BMI is a music performing right organization that has been in operation for more than 75 years. It is recognized in U.S. copyright law as a licensor of music, and currently represents more than 750,000 copyright owners and their nearly 12 million musical works. With a licensing organization like BMI, and again there are many out there, you can pay a yearly fee and be covered for whatever you want to play that’s on their catalog. None of this $250 to $400 per song mess. BMI License Fees For Colleges & Universities. In summary, it’s not right to not pay for the licenses of copyrighted music performed publicly and for profit. It doesn’t matter if you are not the individual profiting. If an artist created the music, they should be compensated. However, it is also not right to overcharge and troll educational institutions who do not seek to make a profit or participate in profiting from said music. There is a gray area that exists in music education called “For educational purposes only”. Unfortunately Copyright Cops seek to exploit that gray area, to their benefit, by attacking the smallest individuals in the chain, the music educators. Until the laws catch up to these acts (cough, NAFME lobbyists, cough) we will have to safely navigate our programs through the sharks by conducting our own research and being knowledgeable about the groups that hurt music education and those that promote it. As someone directly involved with show choir who got sued in California, I’m totally lost by your claim that signing up with BMI protects you from the likes of Tresona. BMI is a PERFORMING Rights organization, and Tresona is going after derivative works (i.e. the arrangements themselves). Tresona has no jurisdiction over what or where you perform, only over the actual sheet music you hand out to your students. Their stance is that unless you acquire a license, you infringe copyright as an arranger as soon as you show notes on a page to another person. The reason they believe schools and directors (and even parents) are ALSO guilty of infringement, is because they then COPY and DISTRIBUTE said “notes on a page” to their students. I agree there is a distinct difference between “license to perform” and “license to arrange”. The BMI reference I made was specifically for college ensembles as companies like BMI have agreements with colleges and universities to license full usage of songs on a yearly basis as long as the music is used for “educational purposes only” (Not for profit). There is a yearly fee that covers the university and all its ensembles for a year (that’s the chart I posted from BMI’s site). Any ensemble at the school can perform any song that BMI has the license to. Whether that’s your arrangement or not. I don’t believe there is currently an agreement or plan for high schools (though there should be). I’ve attended show choir productions where I was asked to purchase a ticket. In those situations, of course there should be licenses acquired (performance and arrangement) and all parties properly accommodated. However it is not fair for HS or college ensembles to pay these licenses when no cover is charged and nothing profited, but this is the gray area that exists where you “could” be charged with infringement. It’s purposely not clear. That’s a music business trick. Do I need permission to perform music as part of a presentation in class or at a training seminar? Congrats and thank you for a great article. Your information is excellent and will researched – therefore you are now a troublemaker. LOL. With regards to #1and #2 – what about a cover band that purchases the sheet music, then learns it on different instruments other than piano? Changes the key (you covered that)? Changes the form? Changes the rock feel to a halftime feel? Makes a ballad an up tempo tune? All of this is murky at best, and is where these companies do most of their preying on schools/directors/arrangers. There is also still much nuance to #2 with regards to the issue that many school districts, universities and organizations (i.e. NCAA) and stadiums pay the ASCAP/BMI fees to cover all music (recorded, live, and cover bands) on their campus/locations used for performances. This would, in effect, cover the instrumental ensembles at the school/within the district (this was one of the issues that got the Tresona lawsuits thrown out of court). In my case, we found out that we were triple covered (School, Stadium, and myself as a publisher/arranger through ASCAP). There is also the issue of how much of that license payment goes to the actual license, and how much is “administrative fees” charged by the copyright “granter” (sic). Also there could be a case made that school bands are, in a sense, large cover bands which provides even more leeway for the performer/arranger and more responsibility on the side of the location hosting/presenting a performance. Keep up the good (no GREAT) work on providing good, real information. Great insight! Thanks for adding to the discussion! Thanks! I took several steps to getting there. 1st I registered with BMI as a songwriter, which was free, then I registered my LLC with them as a publishing company which required an application fee of $150 (If my memory is correct) and a yearly publishing fee of $650. Wow this is great information. I am an arranger and I have had many questions about this. One question, what does it take to begin your own publishing company?